How are public trees effectively cared for on a regular basis? How often are trees assessed for risk? What is the city’s threshold for acceptable risk? Are all trees in highly trafficked areas visited annually? Is there a tree emergency management process in place? Is it part of a larger disaster or storm response plan? How does the city management program incorporate or coordinate with urban forestry community partners? Management plans provide an opportunity to officially define and implement a proactive care program. This often includes institution of a cyclical care program and coordination of efforts with city partners (TreesCharlotte, neighborhoods). It is extremely important to have one in place to define risk management parameters. The development of such a plan is beyond the scope of this project but is critical to any city asset management plan. What is in place now? Currently, the City Arborist, housed in the Landscape Management Division, works with this team to assess, prune, or remove any trees in need of care each year. In addition, the City Arborist's team also responds to service requests received by the public for public tree care or inspections. Read more on the assessment of the existing management approach in Charlotte. However, a formally written and adopted management plan does not currently exist. As of today, tree work is largely reactive. What is needed? How much should the city be spending each year on tree care? A management plan is the key to determining that number. Adequate funding levels are determined by asking how much is needed to annually implement the management plan. In the absence of a management plan, city spending levels can be compared to other cities in the U.S. to help determine appropriate funding needs. 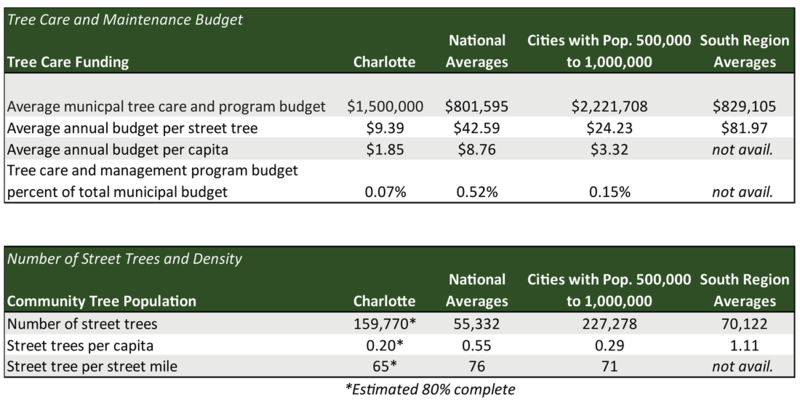 As shown in the table to the right, Charlotte's annual spending per tree ($9.39) is significantly less than the national average ($42.59 per tree), similar-sized cities ($24.23 per tree), and cities in the southern regions of the country ($81.97). After true financial needs are determined, the next question focuses on where to obtain those funds. A combination of the following may be an option: Effective city asset management requires maintenance funds, which comes from the city budget. City council will need to adequately fund proactive tree care to keep citizens safe and extend the life of Charlotte's trees. The management plan may identify a significant increase in funding needed to catch up on the backlog of tree care. Expanding the allowable uses of the Tree Save funds should be revisited to consider short-term use towards tree maintenance (ex. possibly for the next 5-10 years) to help catch up on any maintenance backlog. After this period, these funds can go back to use for purchases of conservation land only. Adjust the roles and partnership between the city, and TreesCharlotte will also help alleviate some of the city's workload by allowing them to focus solely on maintenance, and thus reduce financial needs. Funds should be directed to take care of existing assets. Finally, a key question will need to be addressed: which is a more immediate priority - canopy cover or maintenance of existing trees? ​Note on table above. Data comes from a 2014 national census of municipal tree care and management programs, completed in 2016 by Richard Hauer, of Stevens Point at University of Wisconsin, and Ward Peterson, of Davey Resource Group. The table above compares the study's findings to Charlotte’s municipal tree care and management spending (Hauer 2016). Determine funding required to develop a management plan. Options that affect costs include whether the plan is developed with the assistance of a consultant or is developed in-house. Consider an operational review with the management plan. While a public tree inventory illustrates the amount of work to be done, and the management plan determines how the work will be done, an operations review evaluates the capacity of a department and proposes a series of actions on how to efficiently carry out a management plan. Operational reviews can evaluate the many components of an organization’s urban forestry program, identify strengths and areas for improvement, and ultimately suggest goals, guidelines, and rationale to optimize the program. Elements typically reviewed include workload, staffing, equipment, risk management programs, maintenance, planting, and spending/budget levels. Determine the geographic management areas. Coordinate with neighborhood engagement boundaries. Complete the tree inventory to ensure the plan is developed using a complete picture of the existing conditions. Coordinate cyclical care efforts with city partners. Read more about the proposed role changes for the city and its partners. See an example of the role of partners and city in action. 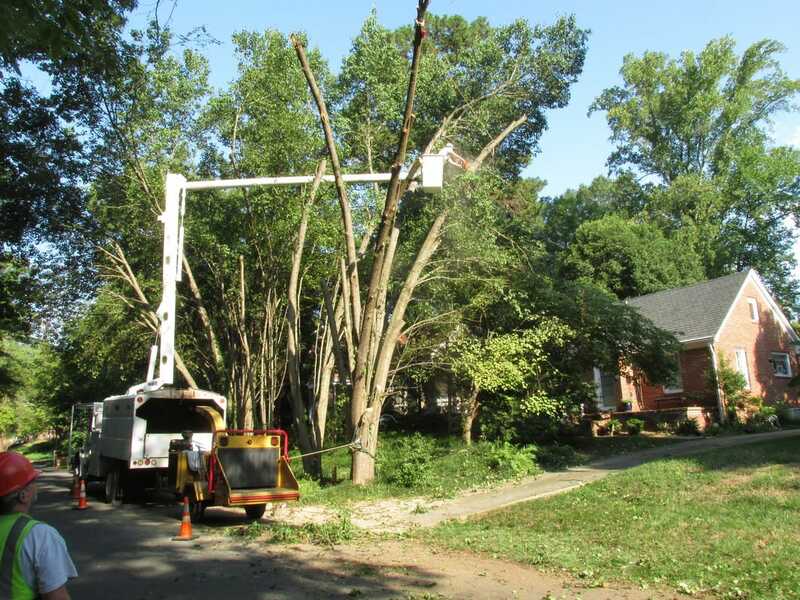 As is the case in many cities, the City of Largo primarily performs tree work in response to requests from citizens, often submitted via the eGov (311) system. Davey Resource Group analyzed two years of eGov tree-related service requests by comparing the requested service locations to locations of trees in poor condition. 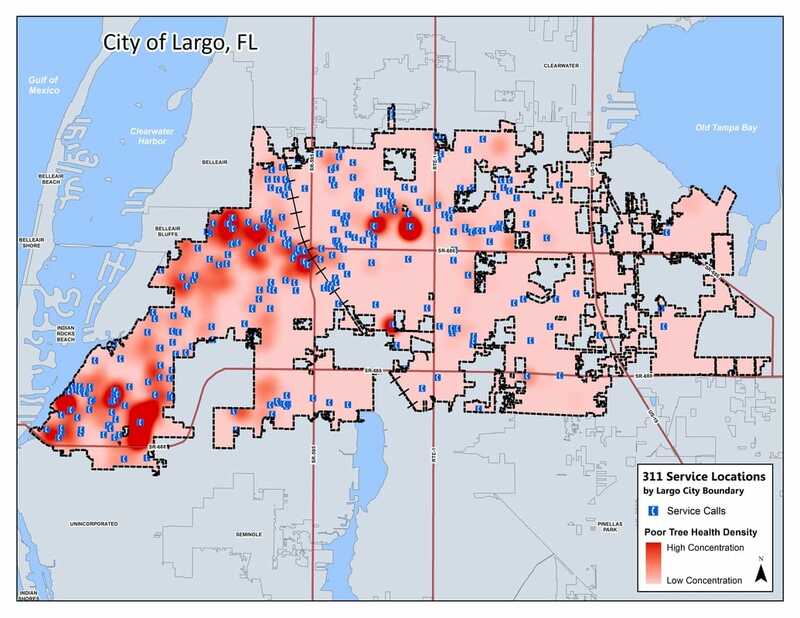 While the map indicates that calls (blue dots) are coming from all over the city, most of the calls are not coming from the areas in highest need of pruning and care (shown in red) according to the city’s professionally completed tree inventory, which includes tree health and condition. This suggests the city's request-based management system does not effectively reach the trees with the highest need for care and is, therefore, an ineffective method for managing the urban forest. A proactive care plan is critical for real progress and effective maintenance. Ideally, municipalities should strive towards a 5-15 year pruning cycle. Though in the real world, longer cycles are often necessary due to budget constraints. Next Action Step: Tree Planting Strategy.